WikiLeaks founder Julian Assange has written an open letter to France's President Hollande, implying he would like to get political asylum in France. However, the Elysee Palace promptly rejected the possibility. In an open letter to French President Francois Hollande published by Le Monde, the fugitive transparency activist said he is a victim of persecution by the US government over exposure of its human rights violations and controversial practices. “For the simple fact of publishing information meriting public interest that whistleblowers had passed to WikiLeaks, I am personally prosecuted for espionage, conspiracy, theft or compromise of confidential US government information and computer violations, risking life imprisonment or worse,” he said. Assange added that Ecuador had probably saved his life by giving him sanctuary inside its embassy in London, thus protecting from extradition. The activist has spent over three years inside the embassy since June 2012. He welcomed the public statements by French Justice Minister Christiane Taubira, who said that Assange may be granted political asylum in France. Such a gesture would be humanitarian and symbolic in nature, sending a message of encouragement to journalists and whistleblowers who take risks to reveal the truth, he believes. 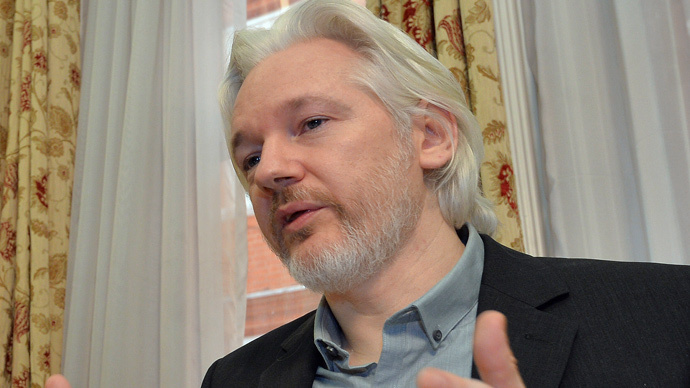 The letter was published on Friday, Assange’s 43rd birthday. However, the request was rejected by Paris less than an hour after the letter’s publication. “After a comprehensive study [of the letter] it became apparent that Mr. Assange’s legal grounds and material situation do not allow France to satisfy his request,” the Elysee Palace said in a statement, saying that his life is not in danger and that there is an international arrest warrant in his name. The swift development sparked a wave of comments on social media. Assange critics branded the move an ‘opportunistic’ attempt to get asylum in France while his supporters blasted Paris for ‘playing US lapdog’ in the situation. WikiLeaks published scores of classified documents including those detailing US surveillance on top French officials, including three consequent French presidents. Washington denied such activities ever happened, but the publications sparked a political scandal in France.